Now, with this ban lifted, the Ministry of Internal Affairs and Communications has identified as a potential issue the activities of minors--that's anyone under the age of 20 here--in relation to political campaign efforts. 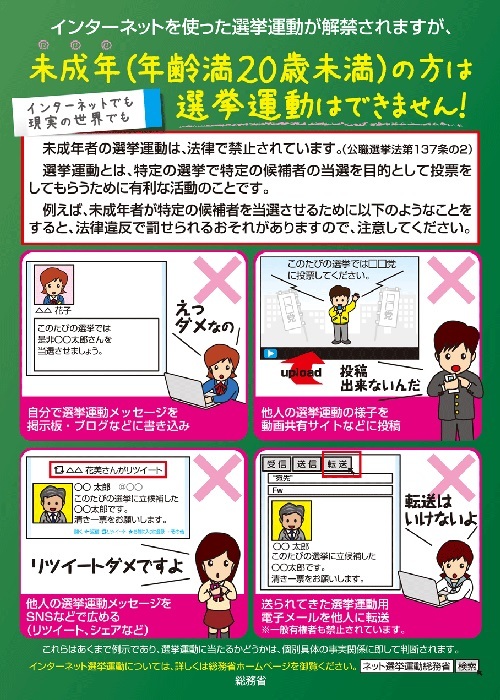 To try to nip any such activity in the bud, the ministry has issued a blanket statement targeting minors, reminding them that they face potential fines of up to 300,000 yen ($3000) and up to a year of jail time should they express public support for a campaign during their online activities. Let's back up and try to wrap our heads around this. First, the ministry is stressing that it is socially unacceptable and illegal for minors to engage themselves in political campaign activities. Electoral campaigning is defined as "Any necessary and advantageous activity for directly or indirectly garnering votes for a specified candidate with the goal of that candidate's election in a specified vote." Activities are not limited to those officially sanctioned by candidates themselves. This means if you're underage, simply writing a tweet in support of a candidate, retweeting a candidate's message, posting on an Internet forum or blog encouraging the election of a particular candidate, "liking" a candidate's social networking page, or forwarding a candidate's email message to friends leaves you open to prosecution. Nevermind that as a minor you'd be anyway unable to vote when election time rolls around. Second, the government clearly expects to, in some degree, be able to enforce this restriction. Now, I envision this as being somewhat akin to current anti-piracy laws, where the laws exist but only seem to be applied in extreme cases--there are only enough resources to hunt down the biggest fish, after all. But what kind of line is drawn here for user privacy? If an anonymous 2ch poster writes up a storm about getting a particular candidate elected, is his IP traced and identity procured to ensure he's not a minor? Does this stance not seem extreme and ultimately futile to anyone else?